Several species of Ganoderma are known to be associated with root-rot disease, especially in Acacia mangium. The purpose of the study was to identify Ganoderma species collected in 5 different plantations of A. mangium in Sumatra and Kalimantan, Indonesia and from Eucalyptus pellita plantations in Sumatra. Root samples were collected from permanent monitoring plots set up in these plantations and from a survey of eucalypt plantations. 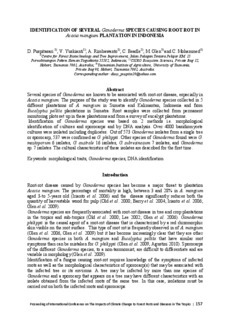 Identification of Ganoderma species was based on 2 methods i.e. morphological identification of cultures and sporocarps and by DNA analysis. Over 4000 basidiomycete cultures were isolated including duplicates. Out of 573 Ganoderma isolates from a single tree or sporocarp, 537 were confirmed as G. philippii. Other species of Ganoderma found were G. mastoporum 6 isolates, G. australe 16 isolates, G. subresinosum 7 isolates, and Ganoderma sp. 7 isolates. The cultural characteristics of these isolates are described for the first time.